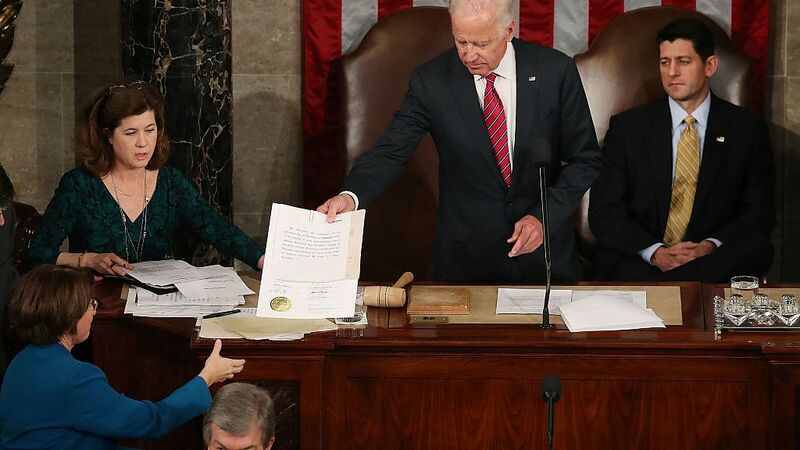 Vice President Joe Biden and Speaker Paul Ryan (R-Wis.) oversee the counting of electoral votes in December 2016. During a CNN town hall on Monday, Sen. Elizabeth Warren (D-Mass.) called for abolishing the Electoral College. She said that “every vote matters,” adding that “the way we can make that happen is that we can have national voting and that means get rid of the Electoral College.” Sen. Warren isn’t alone. Rep. Steve Cohen (D-Tenn.) has introduced a constitutional amendment that would make his state virtually irrelevant in presidential elections. H.J.Res. 7 would abolish the Electoral College. The winner of a presidential election would, instead, be determined by the popular vote. The proposed amendment is not the first of its kind, but the effort to abolish the Electoral College has picked up steam over the past several years. Article II, Section 1 of the Constitution defines the process for the election of the president. Electors are chosen to cast ballots by the respective political parties in their state. Alexander Hamilton explained the thinking behind the Electoral College in Federalist No. 68. This process may vary by state. Although a voter is casting a ballot for president, in reality, he or she is voting on the slate of electors, who will cast their ballots in a manner prescribed by state law. The day on which electors are required to meet and cast their ballots is in statute, 3 U.S. Code 7, which states: “The electors of President and Vice President of each State shall meet and give their votes on the first Monday after the second Wednesday in December next following their appointment at such place in each State as the legislature of such State shall direct.” Electors for the 2016 presidential election met on December 19. The Electoral College has its quirks, of course. The election of 1800 was thrown to the House of Representatives. There was a stalemate between Thomas Jefferson and Aaron Burr, both Democratic-Republicans who each received 73 electoral votes. The House finally selected Thomas Jefferson as president on the 36th ballot after Federalist members from Delaware, Maryland, South Carolina, and Vermont abstained, denying Aaron Burr the White House. The Twelfth Amendment would resolve the issues that came to light during this election. The amendment, which was ratified in 1804, required separate votes for president and vice president. Of course, the Twelfth Amendment didn’t solve the (non)issue of presidential candidates who win the popular vote but lose the Electoral College. Now, 48 states and the District of Columbia have a winner-take-all system. The presidential candidate who wins the most votes in the state wins the electoral votes. Only Maine and Nebraska have, to this point, deviated from this. Both states give two electoral votes for the winner of the popular vote. However, they award electoral votes for the winner of each congressional district. Donald Trump won all three of Nebraska’s congressional districts, so he took the state’s five electoral votes. Although Hillary Clinton won the popular vote in Maine, Trump won Maine’s 2nd Congressional District, allowing him to pick up an electoral vote in the state. According to National Popular Vote, as of January 2018, 13 states representing 181 electoral votes have passed legislation to award their electoral votes to the winner of the popular vote. The legislation in these states will take effect after states representing 270 have passed the National Popular Vote Interstate Compact legislation. States that have passed the compact include California, New York, and Illinois. Colorado joined the list of compact states on Monday. Under a popular vote concept, large population centers would the most influence over presidential elections in the states. This is already true under the Electoral College, but this influence is confined to the state’s electoral votes. Spreading that influence out nationally would tilt would give Democrats a leg up on presidential elections. Considering that there are 3,007 counties in the United States, this is an eye-popping statistic. In fact, Clinton won 87 of these counties on her way to winning a plurality of the popular vote. Conversely, Donald Trump received 29.1 percent of his total votes from these counties, and he won only 13 of them. Another issue with the National Popular Vote Interstate Compact is that it’s almost certainly unconstitutional. Article I, Section 10 of the Constitution states, “No state shall, without the consent of Congress...enter into any agreement or compact with another state.” According to the Council on State Governments, more than 200 interstate compacts are currently in effect. “Twenty-two of them are national in scope, including several with 35 or more member states and an independent commission to administer the agreement,” the group’s fact sheet notes. Many say that the Electoral College is undemocratic and that a popular vote concept is democratic, which is why states should dump the former. Undoubtedly, some who make such statements also believe the Senate is undemocratic because it lacks proportional representation. Put simply, the United States isn’t a democracy; it’s a constitutional republic. State legislators should work to defeat National Popular Vote Interstate Compact legislation. The Electoral College isn’t perfect, but it has served the United States well. Although partisan voters may not always like the outcome when their candidate loses a presidential election, the system has served the country well and will continue to serve us well as long as we stick to it.